By Karrar Haider in E-Commerce. Updated on September 11, 2018 . Before I dive into helping you spot fake reviews on Amazon, let’s understand the current situation of review system. As I said before, many of the fake reviews are identified and removed by Amazon’s automatic systems, as well as through their manual efforts. As incentivized reviews also got banned last year, sellers now have no reliable way to get paid reviews (apart from Amazon Vine). As dumb reviewers are easy to detect, sellers are now hiring professional reviewers. 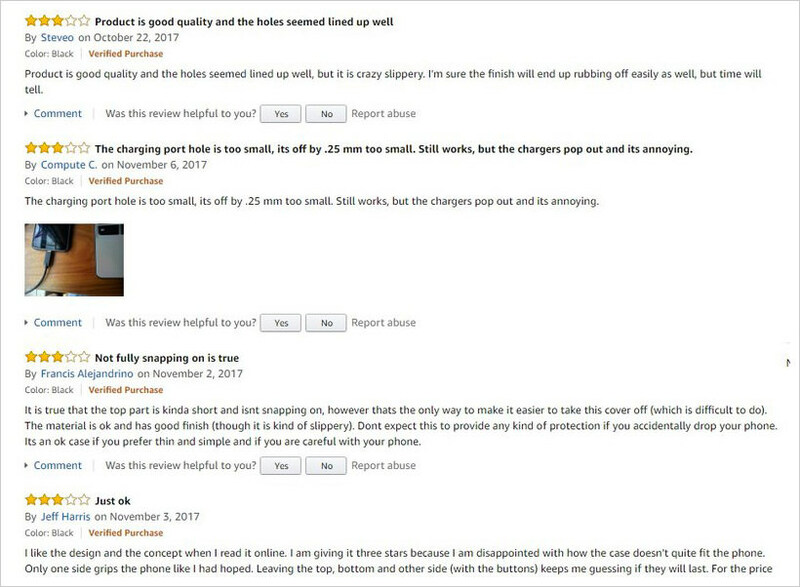 These sophisticated fake reviewers understand the system very well and know how to cheat it without Amazon or the buyer finding out easily. Here is an example of a sophisticated reviewer who makes a living by providing fake reviews. Therefore, I will refrain from listing dumb mistakes that these fake reviewers used to make, most sophisticated ones won’t be making those mistakes. Instead, I’ll focus on review patterns and basic need of sellers and how these reviewers fulfill them. When do the sellers need fake reviews the most? Of course, when they first list their item on Amazon. 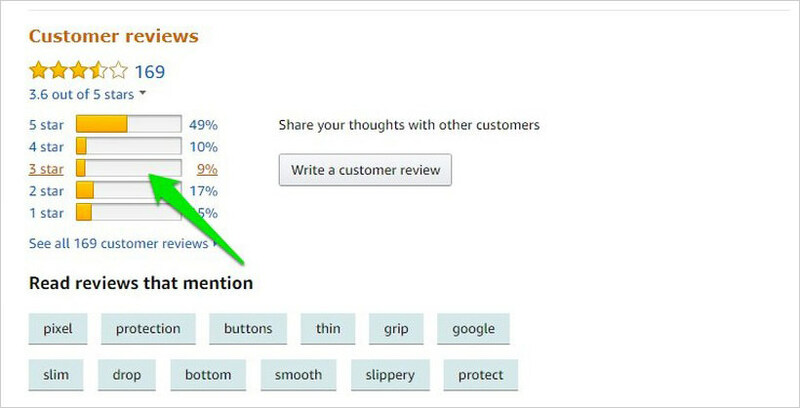 Initially, no one knows the product, so the seller needs a ton of 5-star ratings to make the product visible in search results and attract customers. In the Customer reviews section, click on See all (total reviews in digits) customer reviews link under the rating bars. Now scroll to the bottom and click on the very last page. In my case, it’s 17. Initially, sellers care more about 5-star ratings to rank higher in search results rather than getting positive reviews to attract customers. So, they hire reviewers for cheap who just come and do a one-liner review and give a 5-star rating. If you see lots of 5-star ratings in quick succession along with short meaningless reviews, then there’s a good chance that they are fake. In the screenshot below, you can see that all the reviews are one-liner and also have 5-star rating. In their description, they will be very vague and use words like “love it”, “great”, “good” “worth the money” and “simple”, etc. Due to lack of expertise and product usage experience, the reviewer may even say something false or unrelated. For example, in the below screenshot the reviewer says “I love how this case fits on the Google Pixel 2” in his review on October 17, even though Google Pixel 2 wasn’t even released at that time. His uploaded images also don’t show the case on a Pixel 2 phone. On top of that, he added a good amount criticism to make the review look real, but still gave 5 stars. Do keep in mind that having fake reviews in the start doesn’t mean that seller is selling something low quality. Afterall, they need a way to increase ranking and sell their products faster, and many choose false means. Although you should think twice before buying from such sellers. I am not saying all the 5 star or 1-star reviews are fake, but the fake reviews usually lurk around these sections. As the seller is paying for the fake review, they want to make sure they are able to get the most out of it. Therefore, they either go for 4-5 star rating for positive reviews or 1-2 star rating for negative reviews. However, there is a very low chance of fake reviews in the 3-stars section. 3 stars usually don’t put a noticable impact on the overall rating of the product, so fake reviewer aren’t instructed to give 3-star rating. To see the 3-star reviews, just click on the 3-star bar in the Customer reviews section. Besides, people who usually give 3-star rating also provide a better view of the pros and cons of the item. You’ll just have to use common sense here to guess whether the problems user tell are related to the product or their own taste and mistakes. In the screenshot below, you can clearly see that none of the reviews seem fake and also provide reliable information about the good and bad sides. The Verified Purchase tag below the reviewer’s name confirms that the person has bought the item. 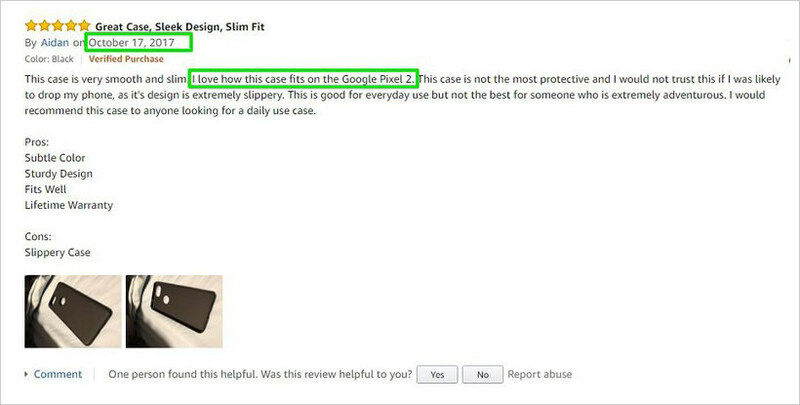 Many people think that if they have bought the item, then the review is probably true. That’s not the case. 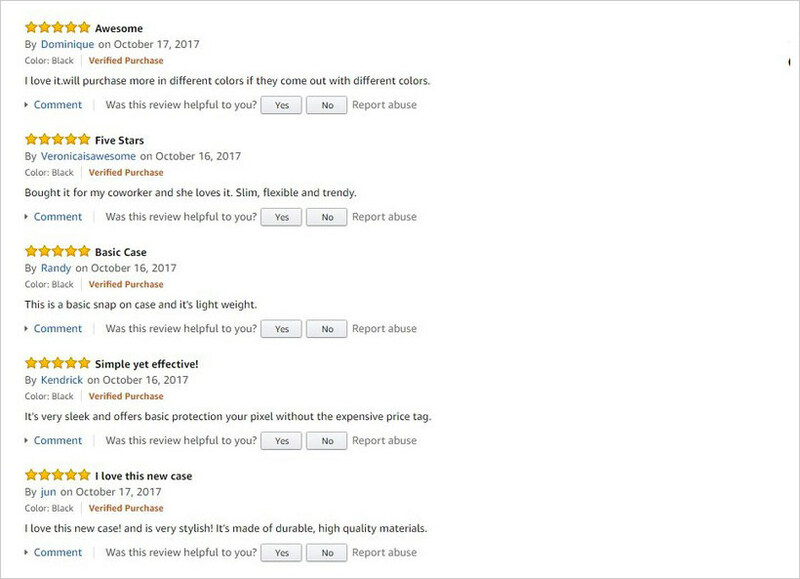 Almost all the fake reviews bought currently involve the reviewer buying the item first before doing a review. After the review, the buyer makes a return request and the seller accepts it. The buyer gets the money back and either is paid separately via PayPal or gets to keep the item. So the Verified Purchase tag is meaningless while identifying fake reviews. It’s better to focus on other metrics mentioned here, then depending on Verified Purchase. This is your best tool when it comes to spotting a fake review. If there is a particular review that adds enough information to help you make a decision, then checking the reviewer’s profile is the best way to confirm its authenticity. To open any reviewer’s profile, simply click on reviewer’s name and it will open up. Fake reviewers usually don’t have a profile picture or have a fake one from a movie or anywhere else. If they do seem to have a regular person’s picture, there is a chance it may be stolen from someone else’s social ID. 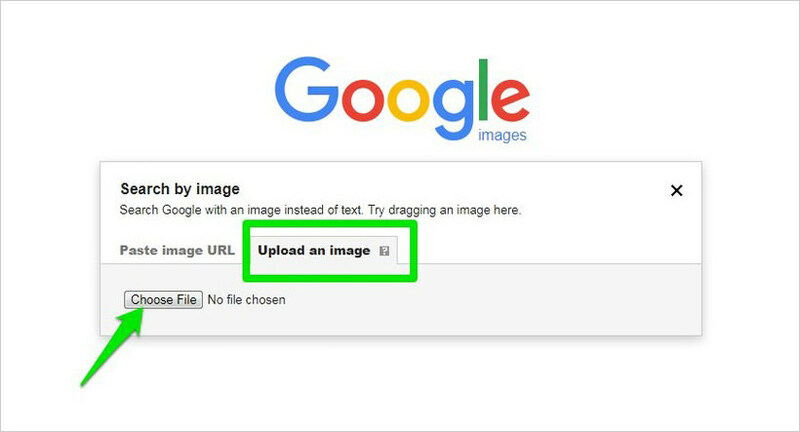 You can upload their profile photo to Google Image search and see if it is available somewhere else. If it is, then it’s a red flag. Fake reviewers get less helpful votes as many people are able to identify them or they usually don’t add much value apart from their rating. As a rule of thumb, if someone has only &frac13; helpful votes compared to their total reviews, then they might be fake. Most of their reviews are either 5 stars or 1 star. They need to make money so they will review often to make a living. Usually, 10-12 reviews per week is a good sign of a fake reviewer. If all the above 3 conditions meet or at least 2 of them, then the review they added would probably be fake as well and you should not let it affect your decision. 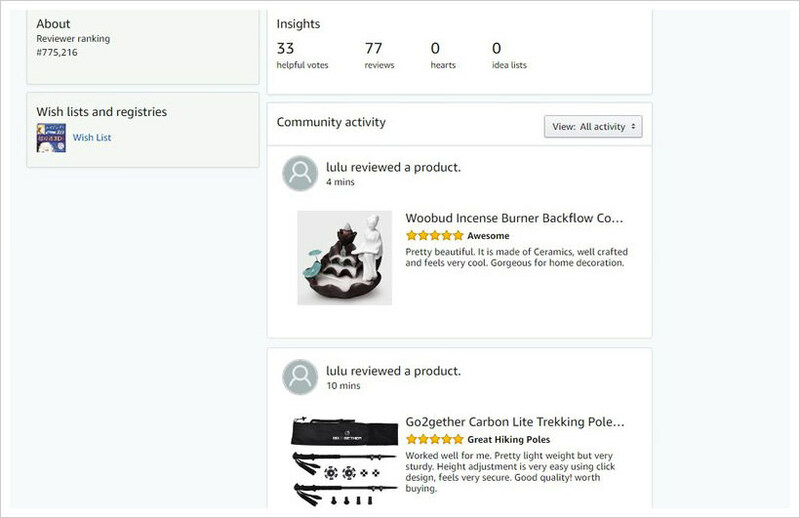 There are two automatic tools that can help you spot fake reviews on any Amazon product, Fakespot, and ReviewMeta. Both of these online tools use dozens of metrics to evaluate reviews of a product and I must say they are very accurate. ReviewMeta arguably offers much more information. However, I prefer using Fakespot as it is much easier to understand and still offers all the information we need. For demonstration, I’ll be using Fakespot. Go to Fakespot and in the middle search field copy/paste the URL of the product you want to scan. When you’ll click on Analyze, a report will be generated immediately. There are multiple sections of the report, and I have explained them below. 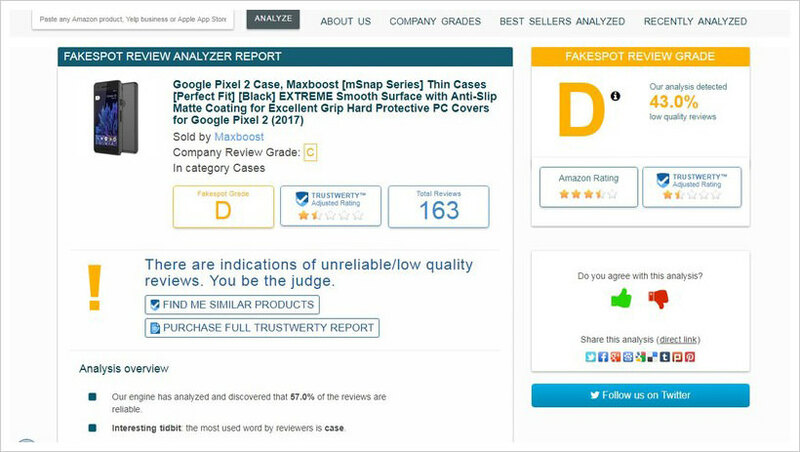 In the top section of the report, Fakespot will give an overall grade to the reviews of the product and show total low-quality reviews. Here A grade means that the reviews are trustable and F grade means almost all the reviews are fake. Usually, C or D grade is a good sign of fake reviews. Here you’ll also see total low-quality reviews in percentage on the right side. This percentage doesn’t mean that all of these reviews are fake. It is simply an estimation of low-quality reviews and there is a higher chance that many of them could be fake. If you scroll a little, you’ll see the Analysis overview section. Here you need to look at the red colored lines that tell you how the reviews of the particular product might be fake. In the following screenshot, you can see that Fakespot suggests that the reviewers are suspiciously positive and the seller is also known for using aggressive marketing. These are clear signs that many of the 5-star reviews could be fake. If you scroll to the bottom, you’ll see a list of reviewers who Fakespot thinks are unreliable (or fake reviewers). You will see the name of the reviewer along with reasons why Fakespot thinks they are fake. You can click on their name to open up their Amazon profiles to investigate further. 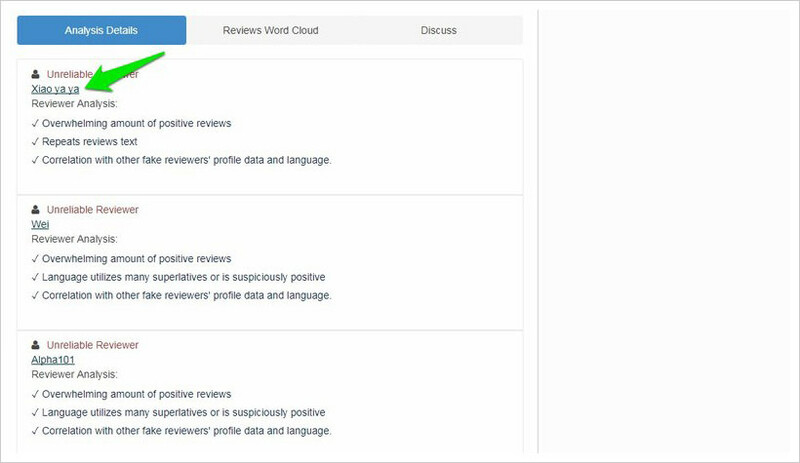 If you see at least 3 fake reviewers, then there is a good chance the seller is hiring fake reviewers to manipulate the review system. All this information provided by Fakespot should be good enough to get an idea whether the product has fake reviews or not. However, it should be kept in mind that it is an automatic system and it can make mistakes. This is why I told you about all those fake reviews identifying tricks first before introducing an automatic tool. You should use Fakespot or ReviewMeta first to get an idea and then use the tricks I have told you in this article to spot fake reviews. 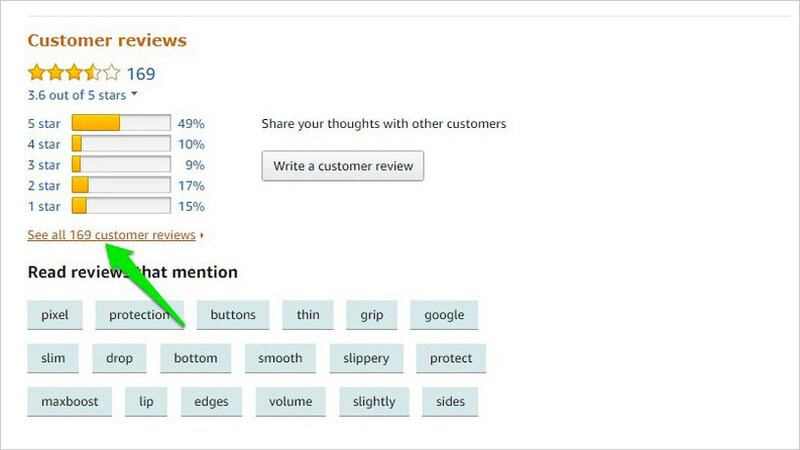 Though Amazon is working hard to get rid of fake reviews by suing fake review sellers and buyers and banning incentivized reviews, however, it’s impossible to fully get rid of this menace. By combining an automatic tool with a little bit of common sense should keep you safe from products made popular by fake reviews. If you manage to find a fake review, don’t forget to downvote it by clicking on No next to “Was this review helpful to you?” section. This will keep the review down and away from the eyes of the other users. Similarly, don’t forget to upvote an honest review to help other users view it.